You want to take a nice stroll in the woods around a new, well-maintained preserve with varied terrain and interesting trails. Background you can feel free to skip: “Did you know there’s a new Scenic Hudson preserve that just opened? I heard it on the radio this morning. It’s supposed to have some nice hiking trails,” a co-worker told me in late 2016. “A new Scenic Hudson preserve? Count me in!” I said. Not only does Scenic Hudson protect and manage some of the most beautiful natural places in the Hudson Valley, it also makes NEW magical places appear with some regularity. Waiting for plate tectonics to create new trails to explore? Takes forever. Centimeters per year, if you’re lucky. But BAM! 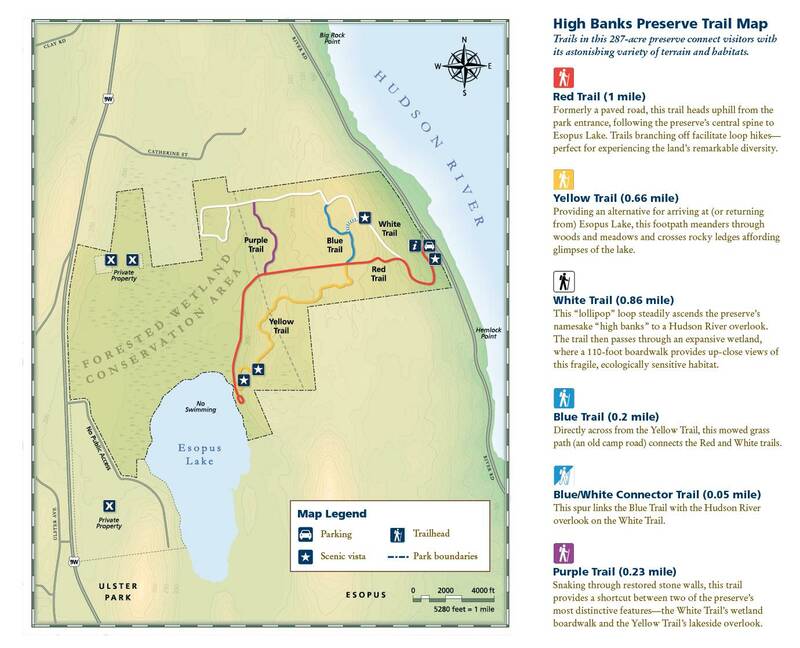 With High Banks Preserve, Scenic Hudson gave you THREE MILES of new trails, all at once. That’s so much quicker than plate tectonics, it’s ridiculous. Advantage: Scenic Hudson. My two boys never went to camp here (though Dodgers great Sandy Koufax apparently did, either as a camper or counselor), but they most definitely enjoyed their day at High Banks Preserve. The trails are wide and well-marked, and there are plenty of points of interest along the way, including a scenic stop by Esopus Lake. While most write-ups on this preserve mention the views from bluffs overlooking the Hudson, you might do well to keep your panoramic expectations in check. This preserve is a fantastic destination that has many wonderful attributes, and its presence here makes the Hudson Valley an even better place to live and visit. In my humble (and often incorrect!) opinion, though, you would do better to come here for the awesome trails, varied terrain, lake overlook, woodland scenery, and overall awesome vibe, rather than expecting mind-blowing panoramas. 2. After you’re done checking out the kiosk, head uphill on the wide gravel road, noting the three red blazes that mark the official start of the Red Trail (more like the Red Road at this point). Away we go! 3. Keep following the Red Trail/Road through a pleasant wooded situation. 4. The White Trail cuts a pleasant, wide path through woods and high grass. If your dad stops to futz with the camera here, feel free to ditch him. Wait, not really! Hold up, you guys! In about five minutes (with time for camera-futzing), you’ll arrive at the bench that marks the overlook. The Scenic Hudson page for this park says that High Banks Preserve “contains bluffs offering superb vistas of the Hudson River.” This spot is the primary overlook marked on the official trail map – it is quite a lovely place indeed, but one might do well to temper one’s expectations about how expansive the vista might be. The view from here actually is quite long. It’s just not very wide. “Down in front, trees!” you might want to say. But they were here first, after all. You’ll want to focus on that long, long view, stretching out over the Hudson. Breathe in that fresh High Banks air. And remember that if you’d sat in this very pleasant spot prior to 2016, somebody probably would have called the cops on you. Or an old camp building would have fallen on you. Now you can sit here all day long if you’d like to! Thanks for the awesome preserve and new scenic bench, Scenic Hudson! 5. Once you’re done soaking in the view, continue along the White Trail. In just a moment, stay to the right on the White Trail when the White/Blue Trail splits off to the left. Just keep following those white blazes. Dudes, wait up! 6. In a few more minutes, when the Blue Trail splits off to the left, stay to the right again to remain on the White Trail. When your hiking partners yell, “Nanny nanny kee kee, you can’t catch me!” on this stretch of trail, you are supposed to try to catch them. Counter-intuitive, I know. Incidentally, when I was a kid, it was “Nanny nanny boo boo,” which doesn’t rhyme at all with “you can’t catch me.” Nanny nanny kee kee is definitely an improvement. The next generation has things under control, right? 7. The trail meanders deeper into the woods, following some old stone walls. About five minutes after the Blue Trail fork, you’ll see the three blazes of the Purple Trail splitting off to your left. We’ll come back here and hop on the Purple Trail in just a few minutes. For now, forge onward on the White Trail! 8. Just a minute or two after the Purple Trail junction, the White Trail performs the amazing feat of forking with itself. This is the start of a short loop that brings you right back to this spot, taking less than ten minutes to traverse. Let’s take the fork on the right. Why not? 9. In one minute, you’ll arrive at the spot billed as a “110-foot boardwalk spanning a wetland” on the High Banks Preserve homepage. On our visit, the conditions had been rather dry, so we didn’t get the full wetland experience. Still, it was an impressive piece of trailwork. 110 feet goes fast when you’re enjoying every step. After the boardwalk ends, keep following those white blazes back to the start of the loop. 10. After you complete the loop, turn right to (briefly!) retrace your steps on the White Trail, looking for the triple-purple blaze of glory on your right that marks the start of the Purple Trail, which you should see in about one minute. When you see it, turn right to hop on the Purple Trail. 11. If you’re a fan of stone walls, this is the trail for you. That’s a big honker, right? In about five minutes, the Purple Trail dead-ends into the paved Red Trail, where you’ll turn right to follow its asphalty goodness, ditching your dad again if possible. 12. Enjoy the stroll on the Red Trail as it takes you deeper into the woods. In less than ten minutes, you’ll see the Yellow Trail joining from the left. We’ll come back to this spot later, but for now, forge ahead on the Red Trail – Esopus Lake is just ahead. 13. About one minute after you pass the Yellow Trail junction, you’ll arrive at the triple-red blaze of glory that marks the end of the Red Trail. To your right, a big fat lake – check it out! Such a peaceful spot. Across the lake, you can see various hills, marshes, and the Lakeshore Villas apartment complex. If you squint really hard, you can pretend the apartments are rocky cliffs, giving this place a Minnewaska-esque vibe. Relax. Soak it in. Enjoy the relative silence in a world that offers precious little of it. When you get bored with that, you can chase your brother with a stick full of glop. 14. When you’re done looking out over the lake and/or playing with lake glop, retrace your steps a minute or so to the Yellow Trail junction, where you’ll make a sharp uphill right turn (almost a U-turn) to hop on the Yellow Trail. 15. Enjoy the meandering Yellow Trail as it cuts through more beautiful woods and across a Central Hudson gas pipeline cut-through (digging here not recommended). It took us twenty minutes to reach the end of the Yellow Trail (at least ten of those minutes were spent playing with interesting sticks – you’ll probably knock it out much quicker than we did). Turn right when the Yellow Trail ends to hop back on the Red Trail. 16. Hello again, Red Trail! We keep leaving you and coming back again. We just can’t quit you. In less than ten minutes, you’ll complete the loop for today, arriving back at the White Trail junction. Remember this place? Keep heading straight on the Red Trail all the way back to your car, which you should see again in about six minutes. That’s it! Time to head back to civilization. Sigh. Thanks for the good times, High Banks Preserve and Scenic Hudson! What a great new addition to the Hudson Valley. You’ve made us all much happier campers. Turn in, hop out, and let the adventure begin! You can also get directions by checking out the High Banks Preserve entry on the HiketheHudsonValley.com Google map. Sorta nearby address for your GPS: This hike has its own address. Sweet! Great! Will you do the Black Creek Preserve or Esopus Meadows Preserve? Just wondering – and by the way GREAT SITE!!! Thank YOU, Jonah! Much appreciated. I have Black Creek Preserve on my “Coming Soon(ish)” list and do intend to write it up one of these days. I didn’t have Esopus Meadows on my radar, but you’ve just put it there. Thanks!